Derived from the Swedish phrase Lagom är bäst, meaning 'the right amount is best; in moderation, in balance,' langom is a deeply held philosophy closely tied to the Swedish cultural and social ideology of fairness and equality. Lagom is believed to have begun with Viking culture: at gatherings, when a bowl of mead was passed around in a circle, it was important that everyone sipped “just enough” or their “fair share” so there was enough to be enjoyed by all. 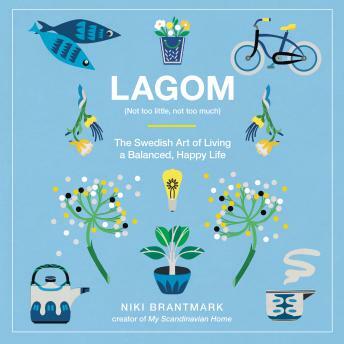 Deeply ingrained in the Swedish psyche, lagom is about enjoying balance in every aspect of life—from work and leisure to family and food and everything in between. Experienced bakers know by touch when dough they’re kneading is “lagom”—not too moist and not too dry. At the office, professionals who work hard—but not to the detriment of other aspects of their lives—are following the ideal of “lagom.” In this inviting, inspirational illustrated guide, Niki Brantmark explains lagom and explains how to incorporate it into your own lifestyle, including: Home: declutter, keep items you love; buy consciously; Work: take regular coffee breaks away from your desk, Swedish style; learn to “switch off” at home; Money: more isn’t happiness—live within your means and be thrifty without sacrificing quality; Body & Mind: exercise that fits your life and healthy habits that make you feel better (starting with more sleep); Food: enjoy that slice of cake, but remember, portions in moderation; Vacation: make the most of holidays and time off; Leisure: get out in nature—take a hike in the woods or a dip in the sea; Family: keep it simple and organized; Friendship: forms bonds that will last a lifetime; And much more. In an interconnected world filled with goal-oriented perfectionists, Lagom reminds us to slow down, to decompress and de-stress, to be mindful of sustainability yet not deny ourselves pleasure. But lagom is not a rigid set of rules—sometimes you need more, sometimes you need less, and that's fine too! With this idea-filled guide you can learn to find greater balance, well-being, and harmony—and most importantly, make time for the things that matter most in life.